For your Saturday afternoon pleasure, we present eight minutes of drag racing from York U.S. 20 back in the day. There's good footage, lots of gear shifting and oh yeah, sound. There's even a cameo from Jungle Pam in this Bee-On Video presentation. Frank Hawley's Drag Racing school hopes they have captured a measure of the excitment of their drag racing school with a new three-minute promo video. Would you believe us if we told you the stunt drivers for this epic drive-in movie from the late 1970s included "240" Gordie Bonin and NHRA Vice President of Operations Graham Light? Better believe it. Never believed a Funny Car could do all that they did in this movie. 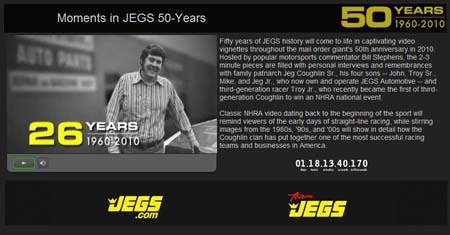 Fifty years of JEGS history will come to life in captivating video vignettes throughout the mail order giant's 50th anniversary in 2010. Hosted by popular motorsports commentator Bill Stephens, the 2-3 minute pieces are filled with personal interviews and remembrances with family patriarch Jeg Coughlin Sr., his four sons -- John, Troy Sr., Mike, and Jeg Jr., who now own and operate JEGS Automotive -- and third-generation racer Troy Jr., who recently became the first of third-generation Coughlin to win an NHRA national event. This blast from the past on YouTube.com features coverage of the 1982 NHRA U.S. Nationals in Indianapolis. The event features some of drag racing's Hall of Fame legends and a memorable first time winner. This video features the classic Diamond P intro and well worth the investment of your time. As part of our CompetitionPlus.com holiday tradition, we've searched the YouTube.com site for rare and entertaining videos to pass the time during your time away from work.